This Water Slide is Over the Top! 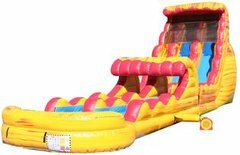 Description: A fun fire and ice theme and durable commercial grade construction means KINDAS The Summit inflatable water slide will kick your summer block party off with style. Twin Slides mean that two kids can go down at once, the attached ladder offer easy access, and the mesh tarp at the top keeps kids in check. The side bumpers are tall and extra cushiony, and the bottom splash pool catches them and keep them safe.